ohmygaaad you guys. i think i've just discovered the most incredibly combination of favourite things ever. ok well maybe that's a bit of a lie because it was actually brought to my attention from a work colleague, buuut still i'm claiming it because he doesn't blog and why am i even telling you this crap. anyway, the point is, my colleague alex has this friend. this baking friend. and he was telling me about his friend's online bakery, and i was all like "oh yeah, that sounds really cool," and he was all "let me show you, it's called fairy tale gourmet," and i was like "omg i've heard of that site, those cakes are insane!" and he was all, "well yeah, that's what i've just been saying..." and that was the point i realised that i never really listen to people when they speak. but basically, if you're a fan of disney, or traditional fairy tales, or just puns at the very least, and of course baked goods then you are going to love this shop. "fairy tale gourmet is an award winning, london based company leading in innovation of high-end chocolates, desserts, and other original gourmet creations, offering a unique experience inspired by the literature of fairy tales." like the little mermaid collection, which includes a sea-salted caramel flavoured cupcake because of course it does. what the ~shell else flavour would it be? the soft vanilla sponge is filled with delicious salted caramel sauce, which oozes out as soon as you rip it open. 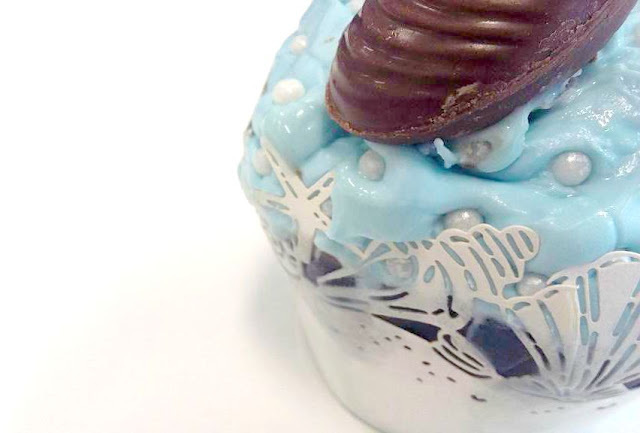 the blue butter cream icing sits atop a light chocolate icing layer, so that when your dinglehopper slices through the whole affair, you come away with an unforgivable combination of flavours. and just when you thought it couldn't get any better, it is all finished with a sea salted caramel chocolate shell on top. just like a glacéd cherry only better! and then there's the red riding hood collection that contains my personal favourite, red velvet hood muffins (not cupcakes!). 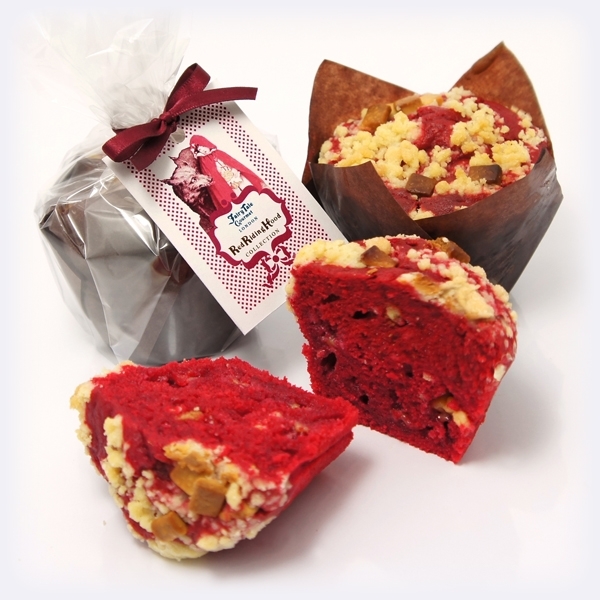 the rich handmade muffins are made from a delightful vanilla and cream cheese combo that is just sooo unusual for a red velvet anything. 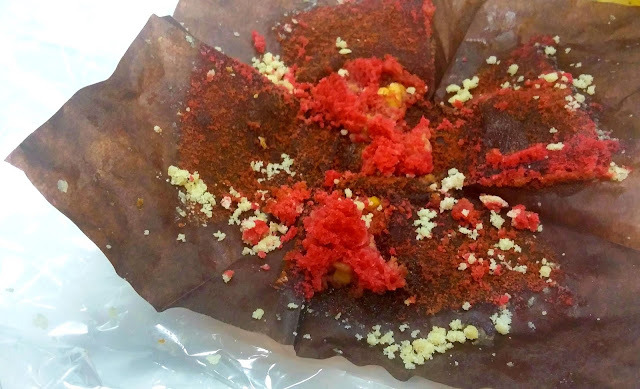 the sponge is like, red red, and not red chocolate, and the top of the muffin had some sort of shortbread-esque and white chocolate bits all over it and ermergerrrd, the cake is god. or, muffin, i should say, i must admit that i don't entirely know the difference between cupcakes and muffins but am sure it has something to do with the ingredients, right? like a muffin has less sugar and a cupcake has more... butter? or something? christ, if you know the answer to this, please do let me know in the comments. now that i've had the pleasure to try the red riding hood and little mermaid collections*, i am determined to try a few more; there are so many other fairy tales to choose from, i don't know which will be next! which is your fairy tale of choice, and had you heard about these guys before now? oh, ps - if you use code NEW15 at checkout you'll nab 15% off your first order!